Happy Easter! 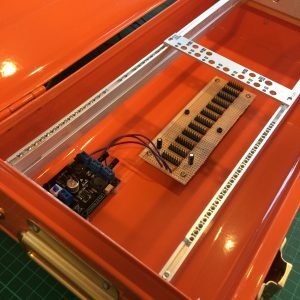 I’ve spent my time off crafting a DIY case to house the modules I’ve been building. 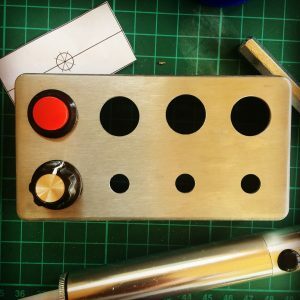 As I’ve been trying to perform using only DIY instruments and effects I’ve built myself, then as Jedi must craft their own lightsaber, it seems fitting I should create my own case. Actually, I already have my Chilli Box case, but I’ve rather outgrown it, size-wise. The case is based around a Habitat trunk which I got in the sale. I used aluminium rails from Mouser, which I set M2.5 nuts into. I cut these down to the correct length with a hacksaw. These were then mounted onto an aluminium mounting frame from Thonk. The frame went together ok, although, getting the supplied bolts to cut a thread into the aluminium rail was a bit tricky, and I managed to rather chew up the head on one of the bolts. Hopefully I don’t need to get that out again! The trunk case has a lip all the way around so I ‘plugged’ this by screwing a block of wood on each side, flush with the lip, that I could then mount the frame into. 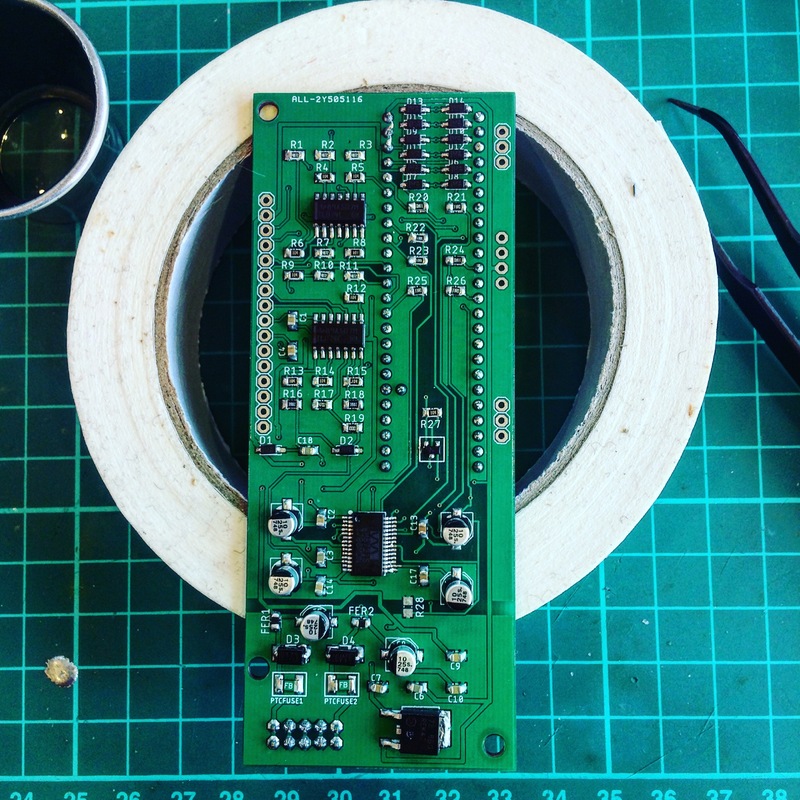 The power supply was just a cheap Chinese board from eBay, that I added a couple of extra filtering capacitors to, and then used Vero board to mount header to for the ribbon cabled to connect to. 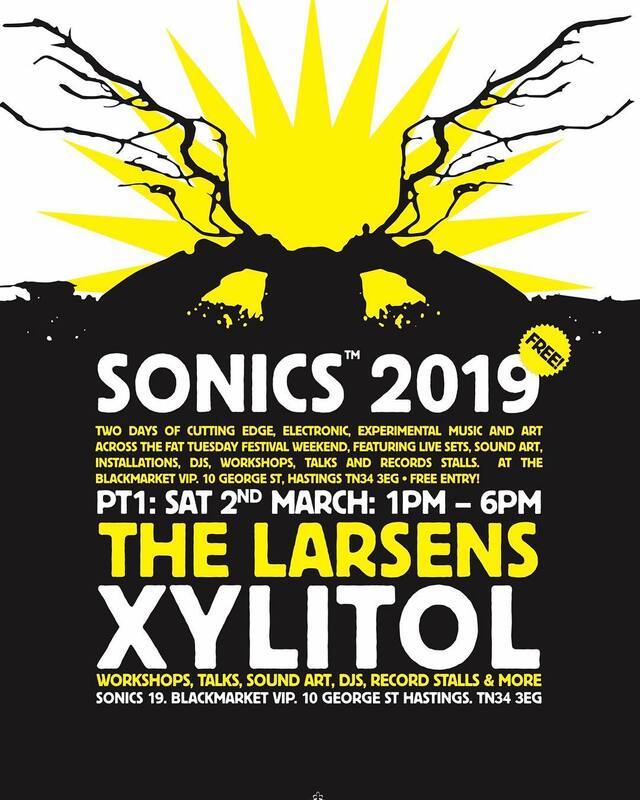 Still need to mount and test it with all my modules, let’s see what new and exciting problems that brings..
I’m going to be in Hastings this weekend, for Thee Saturday Sonics. 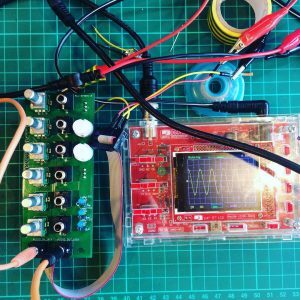 I’ll be doing a talk about DIY instruments and also an improvised performance to show off some of the devices I’ve been building recently. It’s totally free, and on all day. I’ll be on at 2pm. Hopefully see you there! 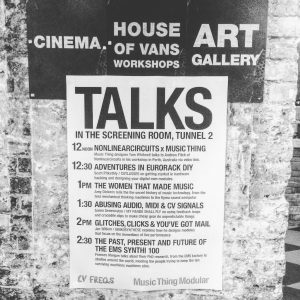 On Saturday (1st December) I was up in London at the House of Vans, speaking about getting started in digital module design for Eurorack. It was a really fun day. My talk was fairly well attended and I got some positive comments and questions which is always a bonus. The venue itself doubles as a skate park, so there were lots of confused looking skaters kids wandering around, bemused by the sheer quantity of wires I expect. Thanks to Tom Whitwell and all involved for inviting me. I found it inspiring to see everyone’s modular systems. 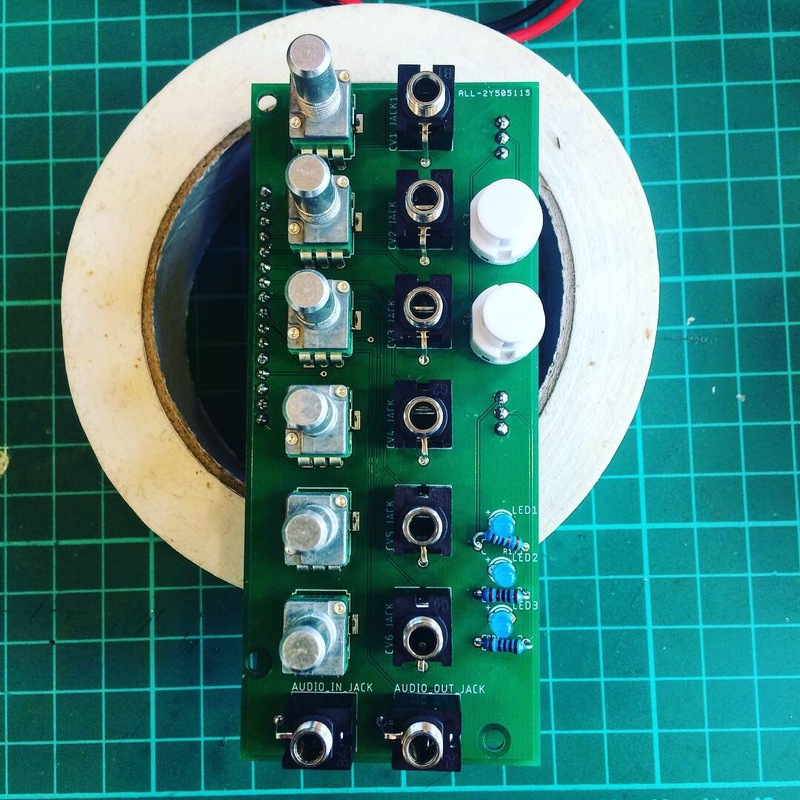 Although it mainly inspired me to build more modules, whereas I need to start making music with my current ones! More on that later. I’ve never owned a Monome, but always loved them. They look beautiful, the apps are inspiring, and let’s face it, they revolutionised midi controllers. 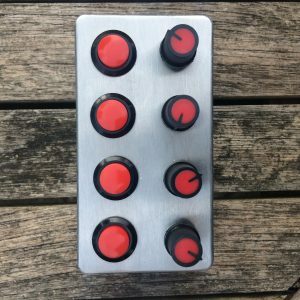 There’d be no Launch Pad if it weren’t for the Monome Grid. 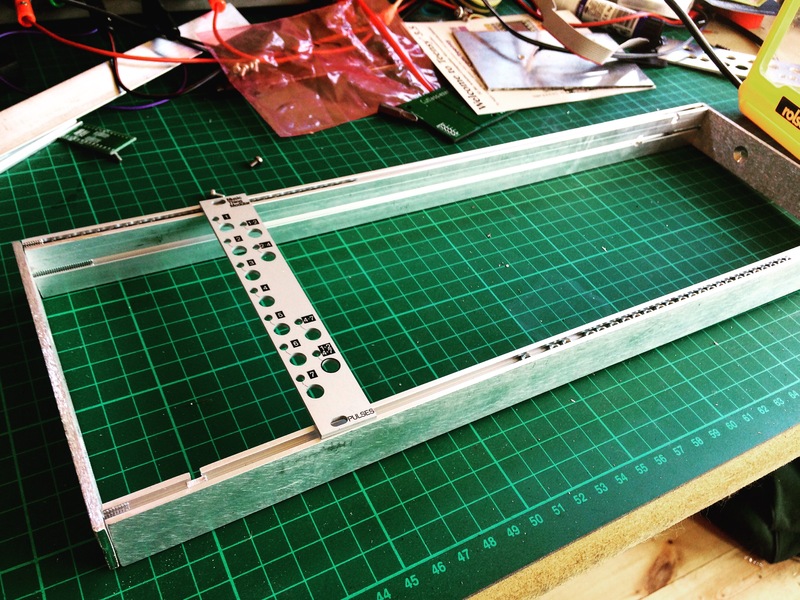 One of the very early apps on the Grid, was MLR, designed by Brian Crabtree, the creator of Monome. I wanted to try and create something similar to this, albeit a crude and inferior version. 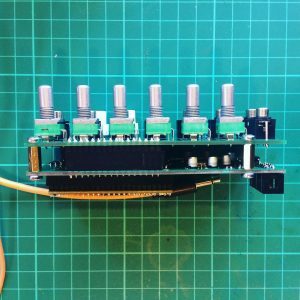 I’ve designed an add-on board for my Cutlassiezer PCB, as used on the Glitch Delay. 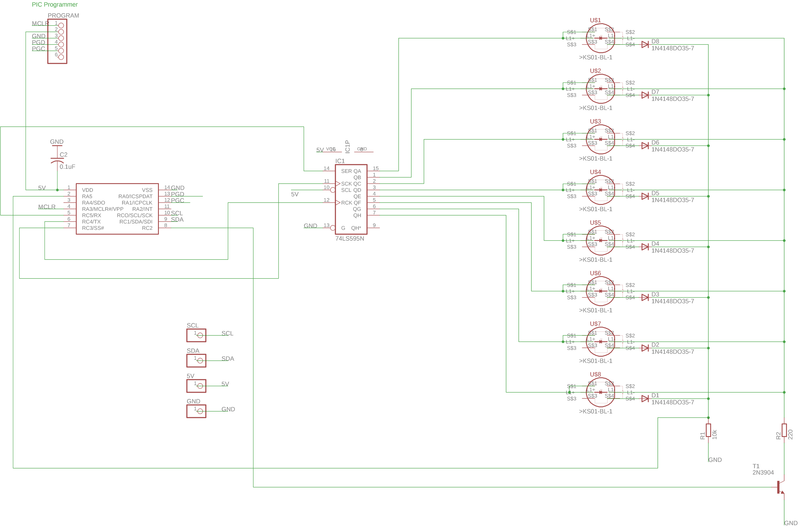 This is based around a PIC chip which communicates to the main Teensy based board via I2C. In this video, the Kalimba is being amplified by the Microphonie, and then into my KhronoKrusher delay module, then into the looper. 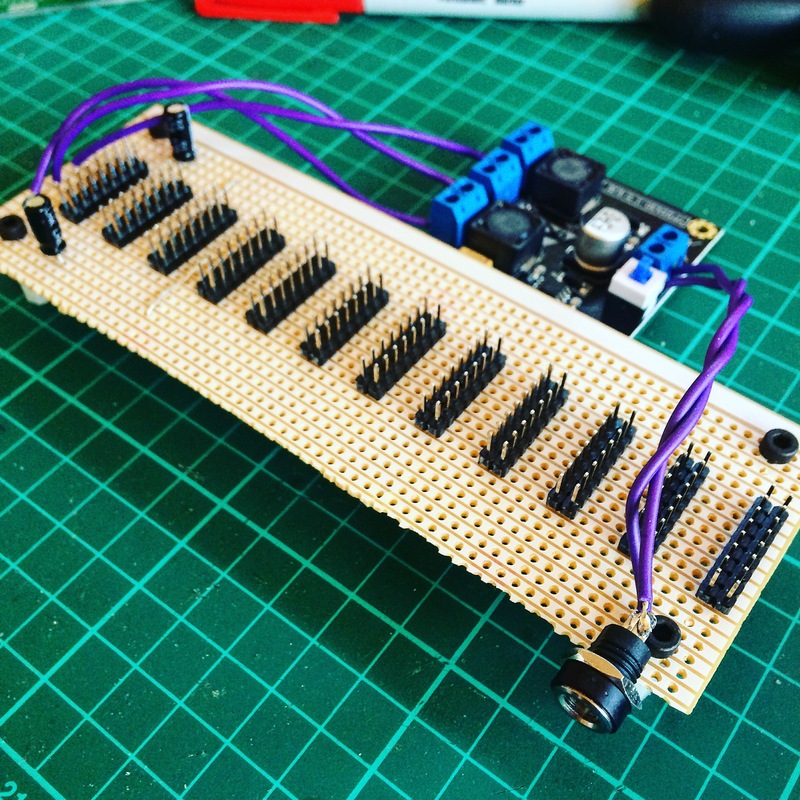 On the main board you can see prototyped on vero-board, the PIC uses a shift register to shift a single ‘ON’ bit through the register. At each bit location, the ON bit can optionally turn on the LED and read the value of the associated switch. This technique was borrowed from the Le Strum by sixty four pixels. The Teensy sends the desired LED states across the I2C bus, and the PIC chip sends back the current state of the switches. 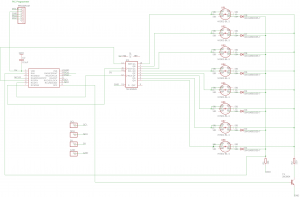 Here’s the schematic from Eagle (click to view an enlarged, readable version). This is just a work in progress at the moment. I’ll give further updates as I progress. As always, the code is available on GitHub here. I’ve been off work recovering from an inner ear operation, which I might talk about more in the future. In between lying on the sofa and general convalescing I’ve managed to finish a new track. The first thing I’ve actually completed since I released the album. 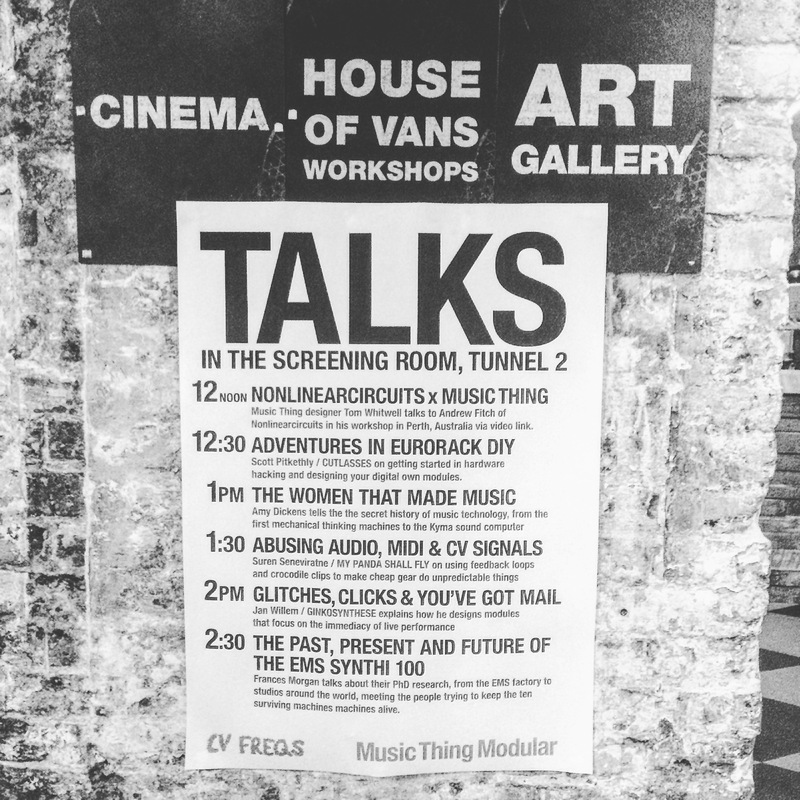 I’m really excited to announce I’m going to be speaking, and possibly performing at Electromagnetic Field festival. 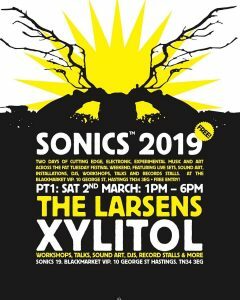 I’ll be doing a talk about DIY electronic instruments. 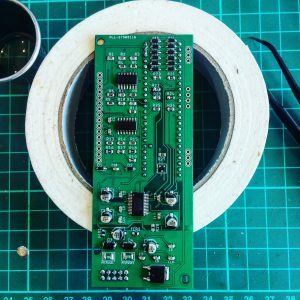 Electromagnetic Field https://www.emfcamp.org/ is a non-profit festival for hackers, artists, geeks, crafters, scientists, and engineers. Sounds amazing! Every camper gets electricity and broadband piped directly to their tent! I’ve been working on a new module specifically for this, more information soon! 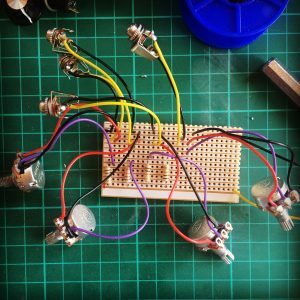 I needed a way to mix the audio from the modules I’d built recently. 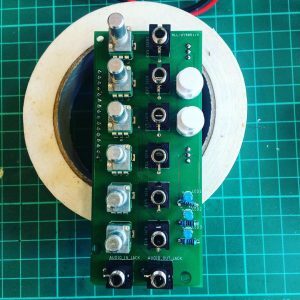 As Eurorack signals are generally rather hot, running 10vpp (considerably higher than line level), I thought a passive solution made sense. The circuit was very simple so I put it together on vero board. A new lesson I have learnt is, be careful where you source your pots! I ordered 8 cheap from China and had issues with all but 2 of them, which resulted in hours of needless debugging. 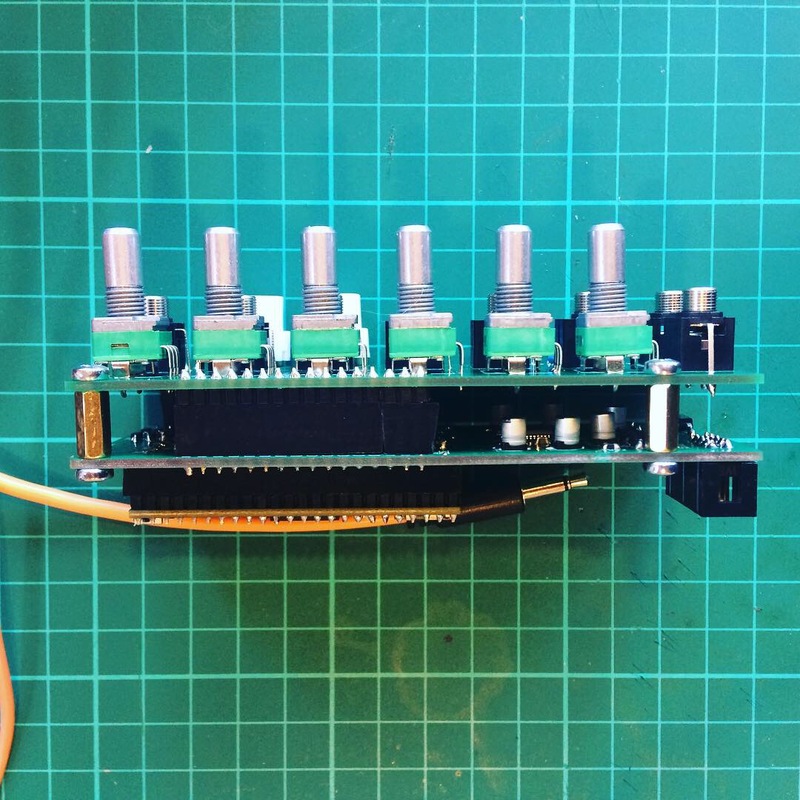 I wanted something to make the project slightly more interesting, so added a kill switch for each channel. 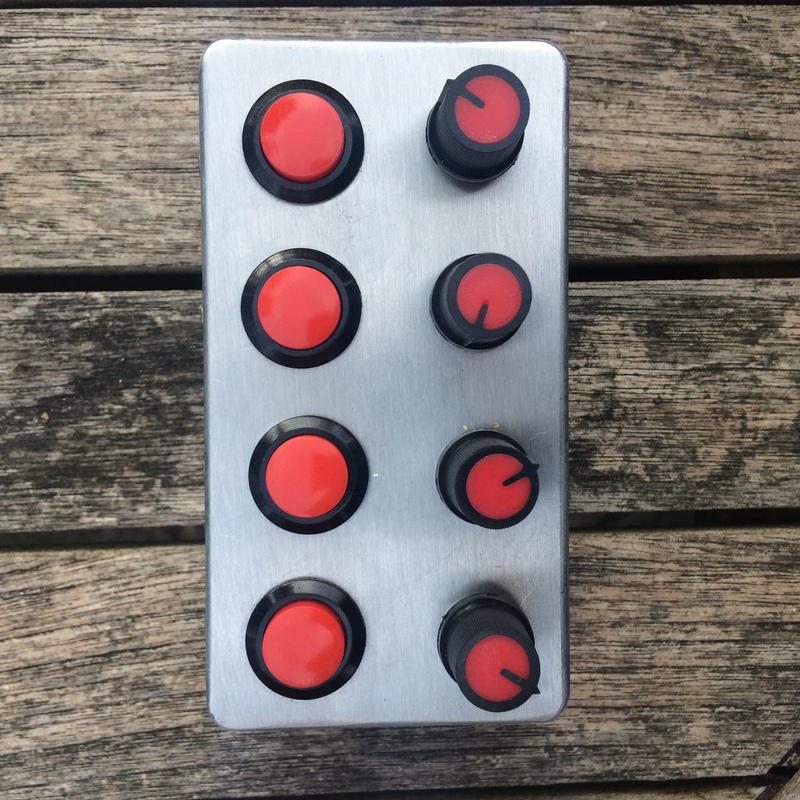 Partly because I thought it would be useful, and partly because I liked the look of these tactile switches! 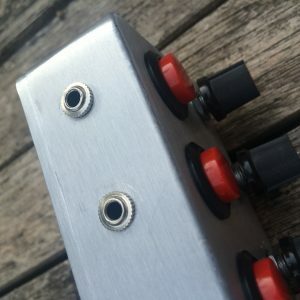 I housed the mixer circuit in a small hammond aluminium case, really glad I bought a pillar drill!